The DAVID SMART (Sensory Modulated Academic Resilience Trainer) integrates the principles of audio/visual brainwave stimulation to help students achieve peak mental performance by reducing anxiety, increasing energy levels and memory capability, counteracting depressive thoughts, enhancing social skills, and improving sleep quality. EXCLUSIVE BONUS SET OF OUR MOST POPULAR AUDIO MP3 DOWNLOADS VALUED OVER $100.00… scroll down for more information! The DAVID SMART provides a unique fusion of audio-visual entrainment, also known as brainwave entrainment. Our sessions have been thoroughly tested and are designed based on the most current research findings to ensure you the most effective results. The sessions on the SMART are designed to improve academic performance, reduce stress, boost mood, and improve concentration and memory in college students. The SMART sessions also include our proprietary randomization process, which helps encourage dissociation and brain frequency tracking to the stimulus. All DAVID light and sound mind machines are approved with CSA, UL and CE electrical certifications for use worldwide! Light and Sound Voyager is 74 minutes of completely synergistic music and effects for any light and sound mind machine session. With six different tracks, it is the perfect companion. For example, listen to tracks 1, 2 and 3 with any energize / beta light and sound session and you will feel pumped. Tracks 4 and 5 will enhance any relaxation / alpha session and track 6, Slow Motion Nebula, is a visualization just waiting to happen. Try track 6 with any theta session and you will understand. The SMART features five distinct categories of sessions: Energize, Meditate, Brain Brightener, Sleep and Mood Booster, with two selections for each category. The SMART also features night-vue ability, which allows the user to see the session select buttons in the dark at bedtime or at night. The Universal Frequency (432Hz) MP3 was designed by Christopher Oliver with the concept by Michael Landgraf. This multi-layered binaural beat MP3 session is based on the scientific evidence unearthed by researchers as they studied the Great Pyramid of Giza and the five other surrounding pyramids. By utilizing the frequency of the universe Mindmachines.com has developed a unique deeply relaxing experience. Session length: 17:44 minutes / Purpose: Deep Alpha & Theta Meditation. Relajacion is our audio MP3 for overworked and overstressed people whose primary language is Spanish. Words spoken by Miguel Villalobos to lead you into a totally relaxed state of consciousness with music to help you maintain these relaxed sensations, this MP3 has 2 tracks: Relajacion: 22 minutos and Tecnica De Relajacion Total: 30 Minutos. Classic Pranayama Yoga is a 12 minute MP3 audio session that assists you in the Art of Yoga Breathing. In a Yogic point of view, proper breathing is to bring more oxygen to the blood and the brain, and to control Prana, or the vital life energy. Pranayama Yoga also goes hand in hand with the Asanas. The union of these two Yogic Principles is considered the highest form of purification and self-discipline, covering both your mind and your body. This session combines verbal guidance with sounds of nature, music, bells and classic Pranayama breathing to maximize your session experience. Ancient Sea: A Journey Through Mono Lake: This downloadable MP3 session is a 30:21 minute excursion to one of the oldest saline lakes in the United States. Breeding ground for several species of birds and home to dozens more, Mono Lake is located in the beautiful Eastern Sierras of California. This soundtrack includes alpha and theta brainwave frequencies blended with music and environmental sounds captured along the shores and tufa spires of Mono Lake. Perfect for relaxation, inspiring creativity and improving focus. Ideal Self-Image is for trimming down weight. This 20 minute session utilizes natural sounds, soothing music, multiple bells and verbal suggestions, all combined with narrow band isochronic tones to help motivate you towards achieving your ideal weight. Attention Deficit Disorder (ADD): This 20 minute downloadable session blends specific isochronic beats with soothing sounds of nature, occasional chirping of birds, relaxing Tibetan bells and beautiful music to gently guide listeners into a state of calm, focused awareness. Tru-Vu OmniscreenTM Eyesets – Our unique Tru-Vu OmniscreenTM Eyesets were carefully designed to provide you with the most effective and safe light and sound experience. This special patented process allows the SMART to stimulate a different frequency in each hemisphere of the brain. This is essential for mood boosting and mental performance. The Tru-Vu OmniscreenTM Eyesets for the SMART use eight blue-tinted white LEDs mounted over a silver reflector behind a translucent screen. This disperses the light evenly. Our Tru-Vu OmniscreenTM Eyesets are specially designed to allow for the left and right visual fields of each eye to be individually stimulated rather than the entire eye. With the Tru-Vu OmniscreenTM Eyesets, the lights flash into the left visual fields of both eyes, then alternately flashes into the right visual fields of both eyes. This approach allows the ability to stimulate either visual cortex with a frequency different from the other visual cortex. For example, a person who functions strongly from the left brain could have 8 Hz stimulated into the right visual field (and therefore the left brain) to slow down left brain function and have 18 Hz stimulated into the left visual field to increase right brain function. (one in each ear)and are perceived to have a beat. Soft-OffTM – The gradual lowering of the lights and tones at the end of the session prevents a startle response (also known as somnatic shock). Soft-OffTM ensures that relaxation and other benefits carry over even after a session has ended. Battery Power Indicator – At a quick glance you can tell if your battery has enough power to run your session. New eyeset technology allows for much longer life for your 9-volt battery. Easy-To-Find Power, Intensity and Volume Buttons – The power, intensity and volume buttons are raised so that you can make the necessary adjustments easily and quickly, even with your eyes closed. Adjust the intensity of the OmniscreenTM Eyeset with the easy-to-find INT button. 10 Preset Sessions – Two sessions in each category: Energize, Meditate, Brain Booster, Sleep and Mood Booster. The SMART light and sound mind machine is easy to use and has ten sessions just like the Delight except the SMART sessions are specially designed to improve academic performance, reduce stress, boost mood, and improve concentration and memory in students. Sound Sync Sessions – Each category also has a Sound Sync Session to turn your music into an intriguing light show. All sessions include HRV and begin with a 3-stage process that enhances dissociation. Your Audio MP3 Bonus Set includes more! LoopLogic Hz Dual Independent Binaural Beat MP3 Session Generator is an instant download MP3 file set broken into Gamma, High Beta, Beta, SMR, Alpha, Theta and Delta audio brainwave frequency categories. Each of the 37 tracks represent one hertz within each category and is created with dual independent binaural beat frequencies. Simply add these frequency tracks to your MP3 Player or playlist and program your playlist to create custom audio brainwave entrainment sessions. Christopher Oliver and Michael Landgraf developed these 515 LoopLogic MP3 tracks for targeting specific frequencies within all brainwave states, enabling you to create personally designed sessions for use with eeg/neurofeedback training, incorporating into music, entraining audiences during presentations, physical workouts, meditation or for just making a good thing better. Applying these sessions have endless beneficial possibilities so use your imagination! Imagine combining these one hertz tracks as a sleep aid or for relaxation or adding to your learning, memory or creative skills! The Art of Losing Weight is a 25 minute session combining the sounds of nature, music, unique tones and verbal suggestions to assist you in your quest for a slimmer you. Lose weight step 1 is a 15 minute session to assist you in beginning your weight loss program. Combining suggestions, nature, music and tones, this session is designed to get you off on the right path. Lose weight step 2 is a 25 minute session, using the same approach as step 1, that will further strengthen your resolve to be a trimmer you. Lose weight step 3 will help you fight the urge to diverge from your goal. This 8 minute session is a powerful weight loss booster. Lose weight step 4 is the final stage in your quest for losing weight. 8 minutes in length, this session will help you maintain the motivation to meet your goal. Deep meditation is for centering, creative thought and relaxation. This 20 minute audio MP3 session takes you deep into the theta brainwave state, just above sleep. Many refer to this as the hypnogogic state, where ideas and revelations can occur. Combining the natural sounds of lakes, music for centering awareness and specially designed tones, you can experience a profound sense of relaxed tranquility. Improving Motor Skills is a 30 minute MP3 audio frequency session designed for musicians to enhance their ability to play instruments, athletes for increasing their performance level and everyday people trying to make a good thing better. 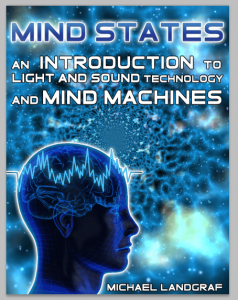 “Mind States: An Introduction to Light and Sound Technology” by Michael Landgraf in PDF format. Mind States will share with you everything you need to know to get started with your light and sound instrument and where to go to learn more! Over 100 pages of easy to understand information including a 30 Day Journal for you as you begin your light and sound experience. For the first time ever, a system exists where meditative breathing may be paced along with an audio-visual entrainment (AVE) session. Long, graceful breathing cycles have been used as part of meditation. Scientifically, this technique has been analyzed and shown to settle down a stressed autonomic nervous system. Both sympathetic (flight-or-fight) activity and para-sympathetic (the brain’s efforts to compensate) activity settle down dramatically using HRV techniques. The heart speeds up with every breath in and slows down with every breath out. This swing in heart rate is HRV. A typical heart beat swing is in the order of about 15 beats per minute (bpm). When people get stressed, the heart typically clamps to sometimes as low as five bpm HRV at times intermixed with sharp spikes in heart rate. This is all abnormal activity and is rough on the heart. The HRV technique used clinically is based on a 10 second breathing cycle (six breaths/minute, by inhaling slowly for five seconds and exhaling slowly for five seconds in an easy, relaxed breath). When using HRV paced breathing, listen to the heartbeat generated by the DAVID SMARTTM through the headphones. Inhale for two heartbeats and exhale for two heartbeats (not your own heartbeats!). Most sessions begin at seven breathing cycles/minute (28 heartbeats/min) and slow to six breaths /minute (24 heartbeats/min). This allows the user to breathe a little faster at the onset of a session until he/she has had time to relax. International shipping charges are not included in the price. They are calculated by our staff and vary depending on your location. When your ship charge has been calculated a PayPal money request for that amount will be sent to you. YOU MUST PAY THE MONEY REQUEST FOR SHIPPING CHARGES FOR US TO SEND YOUR ORDER. If you do not we will email you again and remind you. If we do not hear from you your order will be cancelled and PayPal payment refunded. Mindmachines.com is not responsible for any customs fees, duties or taxes levied by your government for importing mindmachines and related products. Place your order on the website. A money request will be sent to you for the shipping charges by our staff. Pay the PayPal money request for shipping charges. When you pay the PayPal money request for shipping charges your order will be shipped. 20% restocking fee applies to most returned orders. International shipping fees are non-refundable.